FTSE/Russell recently added ApolloMed to its indices but erred in its calculation of float, forcing index funds to buy a disproportionate number of shares; roughly one-third of the actual float. The error and subsequent forced index buying caused shares to spike 50% on 114x normal volume on the day prior to index inclusion. Russell realized its mistake and has slated a reduction of ApolloMed’s index shares by ~86.5% for 9/21, which should force the sale of roughly 1.7 million shares. With an average daily volume of only 130,000 shares per day, we expect the forced sales to crush the stock by the effective date. ApolloMed has complex financials due to several consolidated VIEs. After untangling the web, we believe fair value is $5.80/share, suggesting a ~60% downside scenario on a fundamental basis alone. Apollo Medical Holdings (NASDAQ:AMEH) is the latest example a company whose shares will be subjected to a forced sell-off due to a miscalculation by the FTSE/Russell Indices. We expect the sell-off to severely impact the stock price by September 21st, the date the mistake is slated for correction. By way of background, in December 2017 ApolloMed completed a reverse take-over (RTO) of a company called Network Medical Management (NMM). NMM shareholders hold approximately 82% of the company, with its shares locked up until at least June 2019. FTSE/Russell added ApolloMed to its indices in June of this year, but failed to account for the limited float created by NMM’s locked-up shares. The result was that index funds tracking the FTSE/Russell indices were forced by mandate to purchase a disproportionate number of ApolloMed’s shares; roughly one-third of the actual float. The mistake caused a massive volume and price spike. On June 22nd, the day prior to index inclusion, ApolloMed’s stock ripped almost 50% higher on volume of 2.9 million shares, about 119x its average volume. Insiders have taken the opportunity to sell in the interim, with the company’s co-CEO unloading nearly 30% of his shares from May to present. The company’s co-chief medical officer and a director have also recently sold shares. Russell tacitly acknowledged its mistake in a notice to index subscribers on August 27th which showed that Apollo’s representation in the indices will be lowered by 86.5% going forward. The effective date of this change is September 21st. Thus, by that date the index funds will have to reverse much of their ownership and sell approximately 1.7 million shares that they were previously required to purchase. The scenario unfolding with ApolloMed echoes the recent Longfin debacle. Longfin (OTCPK:LFIN) is a blockchain startup that also IPO’d late last-year via RTO. FTSE/Russell miscalculated the number of Longfin’s freely tradable shares and mistakenly added Longfin to its indices. The low float of Longfin combined with large amounts of forced index fund buying sent shares surging, hitting highs of $74 per share on March 23rd. Longfin was ultimately removed completely from the Russell on March 28th, with shares subsequently plummeting as low as $8.11 in the ensuing days. Similar to Longfin, we expect the FTSE/Russell error with ApolloMed will cause a near-term, predictable collapse in the share price on massive volume. Aside from the forced index sales we believe the company is currently overvalued on a fundamental basis. The stock is up 53% since the December RTO, with a market cap of $535 million as of this writing. The consolidated financials appear attractive at first glance, but look far less rosy after parsing through the company’s complex VIE structures. We believe shares are fairly valued at $5.80 per share, suggesting over 60% downside on just that basis alone. Apollo Medical is a healthcare management services company. In December 2017 the company completed a reverse takeover (RTO) of Network Medical Management, a company that coordinates care for over 600,000 patients throughout the country (Pg. 86). NMM shareholders owned 82% of ApolloMed’s combined company as part of the merger (Pg. 1). With a combined market value of about $350 million upon deal consummation and a listing on a major national exchange, ApolloMed was slated for FTSE/Russell index inclusion. This was the point where FTSE/Russell erred. The index company miscalculated the number of available trading shares by failing to realize that 82% of the stock is closely held and locked up with NMM shareholders. Per the merger agreement NMM’s holdings unlock on a staggered schedule starting 18 months after the merger date, with unlocks beginning in June 2019. (Pg. 157) So while there are 33 million shares outstanding, there were only about 6 million shares available after excluding NMM’s holdings. The mistake forced the purchase of an estimated 2 million shares by index funds, or roughly one third of the actual float. At some point Russell became aware of the issue, and on August 27th announced that Russell index shares in ApolloMed would be reduced by a factor of about 86.5%. The change is to be made effective as of September 21st, suggesting that index funds tracking the Russell will be forced to sell ~86.5% of their holdings, or an estimated 1.7 million shares by that point. Given that the stock only trades an average of 130,000 shares a day, the adjustment will likely be catastrophic to the share price both in the run-up and upon the effective date of the change. Additionally, an ApolloMed director and the co-Chief Medical Officer have sold a collective 37,948 shares between 8/17 and 8/27. 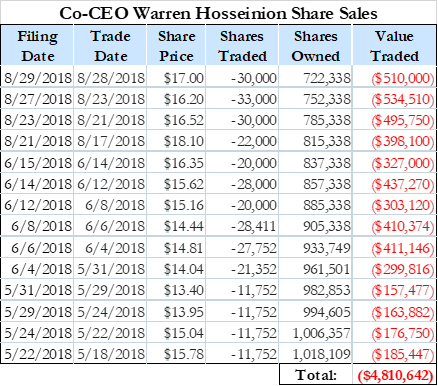 The artificially high price and insider sales have led to a recent sell-off from the stock’s post-index inclusion peaks. With the upcoming downward index adjustment we expect the decline to intensify substantially. On the fundamental side the company looks attractive when just taking a high-level glance at the financials, but a deeper look shows that the metrics are rendered much more complex due to a series of partially-owned Variable Interest Entities (VIEs) that are consolidated into the financials. The reason the VIEs are in place makes sense. States have laws that prohibit business entities with non-physician owners (such as ApolloMed) from practicing medicine (Pg. 15). In order to work alongside physicians ApolloMed must operate with a degree of separation from the physician’s practices. They then monetize their physician relationships by maintaining long-term management services agreements with affiliated independent practice associations. What this all means for ApolloMed is that the economics between the company and its consolidated VIEs are not completely pari passu. The reported consolidated metrics therefore paint an incomplete picture of the financials. After stripping out the effects of the VIE consolidation the financials look far less attractive. For example, the combined company generated $23.6 million in net income for the first 6 months, or an implied run rate of over $47 million in net income for the year. On a standalone basis however, net income attributable to ApolloMed (excluding non-controlling interests) was only $4.8 million for the first 6 months of the year. When applying the standalone net income run-rate to the full year we arrive at ApolloMed’s P/E of roughly 56x, an incredibly rich multiple compared to similar businesses that often range between 15x-25x. The balance sheet also appears robust and cash-rich on a consolidated basis, but the assets and liabilities of the company’s primary VIE are non-recourse (Pg. 39). The picture is less attractive when excluding its primary VIE and isolating ApolloMed’s standalone metrics. On a standalone basis the company’s cash balance is $55 million versus a consolidated $110 million. When stripping out goodwill and intangibles, ApolloMed as a standalone is left with a mere $16 million in tangible equity. The company does not report deconsolidated revenue, but Q/Q consolidated revenue declined modestly from the latest March to June quarters. On the earnings side, Q/Q earnings attributable to ApolloMed increased by a robust 23%, but given the limited data points post-merger it is difficult to establish a long-term trend for either revenue or earnings. Taken all together, when applying a reasonable 20x P/E multiple to ApolloMed’s standalone metrics we arrive at a price per share of about $5.80, a nearly 62% discount to current share prices as of this writing. This looks to us like a rare scenario where an index mistake is poised to force a short-term flood of selling pressure on a stock. We believe share prices have been significantly elevated by the FTSE/Russell index error and will likely converge closer to intrinsic value very quickly. Best of luck to all. Disclaimer: Use of Hindenburg Research’s research is at your own risk. In no event should Hindenburg Research or any affiliated party be liable for any direct or indirect trading losses caused by any information in this report. You further agree to do your own research and due diligence, consult your own financial, legal, and tax advisors before making any investment decision with respect to transacting in any securities covered herein. You should assume that as of the publication date of any short-biased report or letter, Hindenburg Research (possibly along with or through our members, partners, affiliates, employees, and/or consultants) along with our clients and/or investors has a short position in all stocks (and/or options of the stock) covered herein, and therefore stands to realize significant gains in the event that the price of any stock covered herein declines. Following publication of any report or letter, we intend to continue transacting in the securities covered herein, and we may be long, short, or neutral at any time hereafter regardless of our initial recommendation, conclusions, or opinions. This is not an offer to sell or a solicitation of an offer to buy any security, nor shall any security be offered or sold to any person, in any jurisdiction in which such offer would be unlawful under the securities laws of such jurisdiction. Hindenburg Research is not registered as an investment advisor in the United States or have similar registration in any other jurisdiction. To the best of our ability and belief, all information contained herein is accurate and reliable, and has been obtained from public sources we believe to be accurate and reliable, and who are not insiders or connected persons of the stock covered herein or who may otherwise owe any fiduciary duty or duty of confidentiality to the issuer. However, such information is presented “as is,” without warranty of any kind – whether express or implied. Hindenburg Research makes no representation, express or implied, as to the accuracy, timeliness, or completeness of any such information or with regard to the results to be obtained from its use. All expressions of opinion are subject to change without notice, and Hindenburg Research does not undertake to update or supplement this report or any of the information contained herein.